Alresford Osteopathic Practice is based in the beautiful market town of Alresford, near to Winchester, in Hampshire. Established in 2005, we are the oldest and first operating osteopathic practice in Alresford. Our osteopathy patients come from Alresford, across Hampshire and the South East. We also have a sister practice nearby in Medstead, Alton. The practice provides a professional, clean, calm and relaxed atmosphere offering caring, effective and safe treatment. Conditions we treat include: Back Pain ~ Neck pain ~ Joint Pain ~ Sports Injury ~ Tendonitis ~ Repetitive Strain Injury ~ Headaches ~ Problems affecting Joints, Tendons, Muscles, Ligaments of the body ~ Postural advice and more. The whole family can benefit from the services we offer. 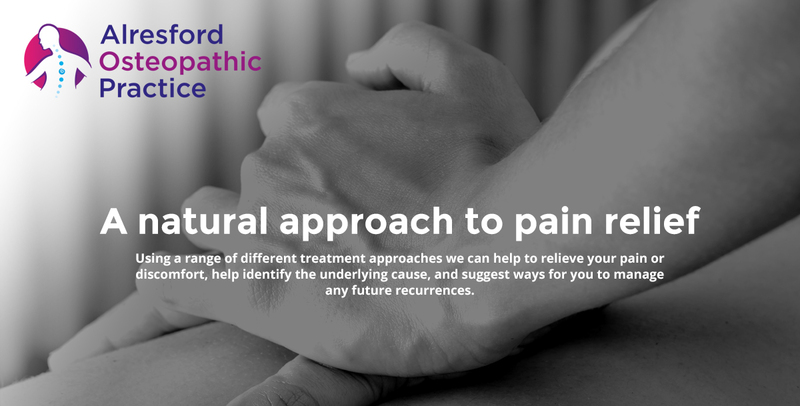 Whether your condition impacts significantly on your daily activities, or causes niggling aches and pains, osteopathic treatment could bring you relief. Treatments for newborns to great-grandparents, builders to office workers, pregnant mums to athletes and everyone in between - the aim remains the same; maximum vitality and quality of life, to facilitate the healing process and optimise the function, mobility and health of the whole body. Appointments: Available most days of the week including Wednesday evening and Saturday morning. We are covered by most major health insurance companies. However, patients are reminded they are responsible for the cost of treatments. Receipts are issued which can then be reimbursed by their health insurance provider. Data protection: Please read our data protection policy here. After suffering a head injury I was very keen to find alternative help with the headaches and neck pain I was still suffering. I was told that there was nothing wrong with my neck however after I went to see Michael he found that I had neck compression in a number of the vertebrae. Soon after my headaches started to disappear and I got the mobility back in my neck. I remember clearly at about 2 or 3 weeks when suddenly my forehead wasn’t sore to touch anymore. It had been painful for so long and the relief was amazing. Michael is professional, knowledgeable and thorough and I would recommend him to anyone suffering pain. He has magic hands! After a year of shoulder and back pain I was getting a bit down...and thought I would give Michael a chance. Within 3 months the transformation startled me. The diagnosis and treatment were pinpoint accurate...If results are your priority, 'Go for it'!